Retinoblastoma is a cancerous tumor of the eye often seen in young children. Retinoblastoma may spread to the brain and other organs such as the liver. It may cause death if not treated. Retinoblastoma accounts for 3 percent of all childhood cancers. Retinoblastoma is a rare tumor and is seen in one in 15,000 to 18,000 live births. Retinoblastoma occurs due to an uncontrolled growth of primitive cells of the retina, the inner light sensitive layer of the eye. The primitive retinal cells differentiate to form various cells present in retina. The primitive retinal cells become cancerous and multiply in uncontrolled fashion to form retinoblastoma. Primitive retinal cells disappear after three years of age, which is why retinoblastoma occurs primarily in young children. Retinoblastoma occurs due to a mutation in a gene present on chromosome 13, called the RB1 gene. The mutation can be inherited or non-heritable. Forty percent of cases of retinoblastoma are heritable. The mutation in heritable retinoblastoma is pased from parents or occurs in the womb's cells. Heritable retinoblastoma usually affects both eyes and is asociated with other cancers such as osteosarcoma (bone cancer), cancers in the brain and lungs, and melanoma (cancer of pigmented cells of skin). Risk factors of heritable retinoblastoma include a history of retinoblastoma in parents or siblings. Advanced age of the father is also found to be a risk factor. Non-heritable retinoblastoma occurs due to a mutation in a primitive retinal cell. It usually affects one eye and is not transmitted to children. Retinoblastoma usually occurs in very young children and is detected within the first two years of life. The most common symptom of retinoblastoma is a white pupil also referred to as leukocoria. This may be noticed first in family photographs. The parents notice that the pupil of the affected eye looks white as compared with the other eye. The pupil resembles a cat's pupil. Whiteness of the pupil is due to reflection of the light from the tumor. Squint or deviation of one or both eyes may be the first symptoms in some children. 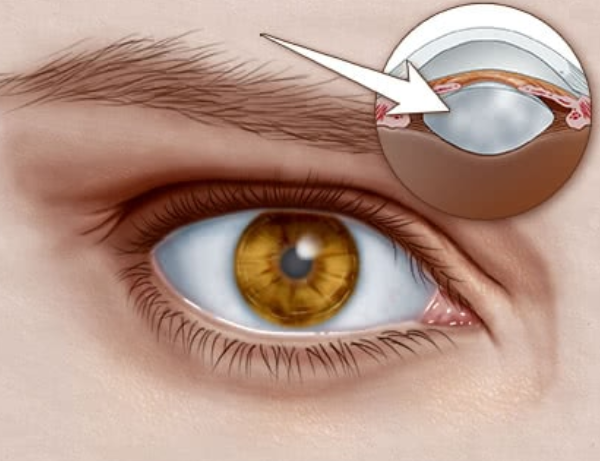 The tumor reduces the vision in the affected eye, which deviates outwards from the normal resting position of the eye. Cataract is the leading cause of blindness in the developing world, statistics showing that as much as sixty two percent of blindness is caused by cataract. But this figure, although seems worrisome, does not stem from the seriousness of the disease, rather it is due to lack of access to basic health facilities for majority of the population in developing countries. Nowadays, cataract has been looked upon as an inevitable age change rather than a disease. And it is completely treatable with a very good vision after surgery, owing to the advancing techniques and technology which have surfaced in recent times. Our eye is provided with a clear transparent structure, the lens. It focuses the incoming light rays from the outside on to the retina (a highly sensitive layer which sends visual signals to the brain). Thus a normal functioning, clear lens is essential for good eyesight. When, due to any cause, most usual being increasing age, any opacity occurs in the lens, it is termed cataract. Initially posing no problems, it progresses and may cause complete loss of sight. Age changes in the lens fibers cause the patchy opacity in the lens. Experts have opined that cataract arises due to an imbalance of nutrients and fluids in the lens substance. This leads to abnormal functioning of the mechanisms that ensure the maintenance of clarity of the lens. Gradually this patchy opaque spot increases and covers the whole surface of the lens. And the vision is hampered progressively. You know the time to visit your ophthalmologist has come when the symptoms become evident and annoying. Cataracts are easy to diagnose. They can be revealed on eye examination, even using a simple torch light in late stages appearing like a grayish white area in the pupil, which is a black area in the centre of the pigmented iris. Early cataracts are detected using a slit lamp microscope or an ophthalmoscope which helps the doctor to visualize it and even find its extent directly.